Hardcover, 11 x 9 in. / 96 pgs / 50 color. 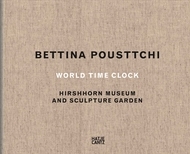 For World Time Clock, German-Iranian photographer Bettina Pousttchi (born 1971) photographed public clocks at precisely five minutes before two at selected sites in 24 cities, including Cape Town, Dubai, New York, Sydney and Mexico City. This project was shown at the Smithsonian Institution’s Hirshhorn Museum and Sculpture Garden in Washington, DC in spring 2017. FORMAT: Hbk, 11 x 9 in. / 96 pgs / 50 color.